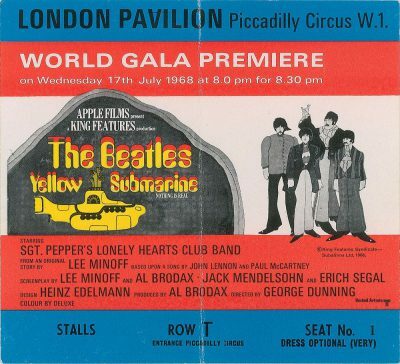 Today the Fabs were excused from the studio to take a field trip to Piccadilly Circus, where they attended the world premiere of Yellow Submarine at the London Pavilion. It appears to have been quite the happening. All four Beatles were there, as were Yoko, Pattie Harrison, and Maureen Starkey. Jane Asher was conspicuously absent — sometime right around here was where she walked in on Paul in bed with Francie Schwartz and dumped him. That may already have happened at this point, or may be just about to happen; tragically the exact date of this important event is not recorded by history. We just stood around as everyone came in. I remember seeing Status Quo, Grapefruit and some members of The Who. And then all of the sudden camera flashguns started going off everywhere, and the whole place buzzed as the Beatles arrived with their entourage. 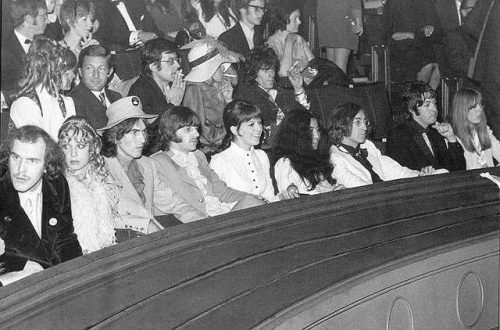 They went down to the front row of the “dress circle,” closely followed by the photographers, and as the photographers left I noticed two empty seats behind Paul! But wait, who’s that sitting next to Paul? I swear it looks like Nico, but apparently it’s Jenny Boyd, Pattie’s sister. All the way on the other end, next to Pattie herself, is Neil Aspinall; his expression says that someone has just leapt from the stage brandishing a pistol and shouting “Sic semper tyrannis!” Other than that, how did you like the movie? Paging Mike Hunt. Paging Mike Hunt.